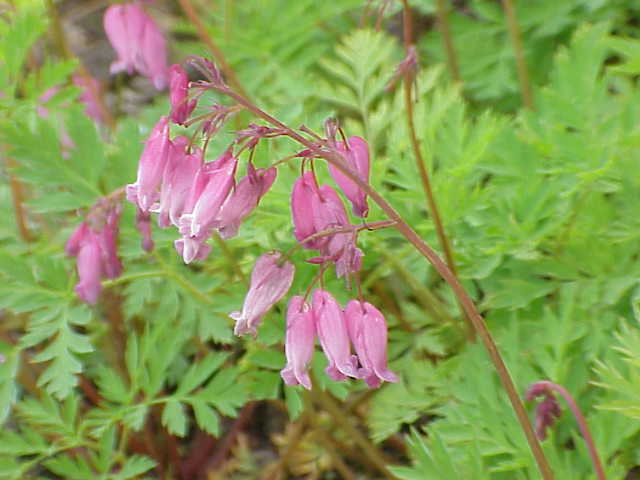 Dicentra eximia is a perennial herb about 30 cm tall; clumps spreading from a short, stout rhizome. Leaves basal, dissected, segments toothed, pale bluish green, smooth; infl ca 40cm. Flowers pink, bilaterally symmetrical, ca 2 cm, nodding, more-or-less heart-shaped, , May-April. Fruit a narrow capsule with several seeds; seeds with white fleshy attachment (aril), probably ant dispersed. Frequency in NYC: Very infrequent in NYC, escaping from cultivation. Origin: Mostly southern Appalachians but as far north as northeaster NJ and western NYS (USDA, NRCS 2006). Habitat: Open woods, edges. Sometimes locally frequent on sites near cultivated plants.